KIDS for the BAY will engage your entire elementary school community in hands-on science lessons aligned with Next Generation Science Standards and Common Core reasoning. 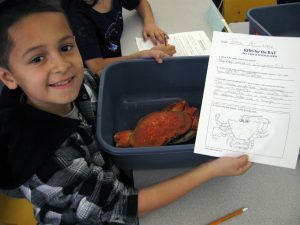 Each grade level will adopt a special habitat and learn how the school neighborhood, local creeks, the San Francisco Bay and the Pacific Ocean are inter-connected in the unique San Francisco Bay estuary watershed. 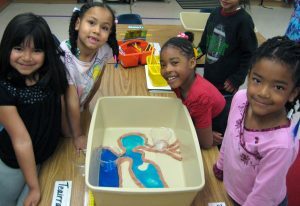 Students will perform science experiments, build ecosystem models, investigate real organisms and much more! Professional development in environmental science education will be provided for teachers. Take action as a school to reduce plastic trash and marine debris, practice the Five Rs (Reduce, Reuse, Recycle, Rot and Refuse) and conserve water and energy. one Grade Level Specific Curriculum Guide including Teacher Preparation Lessons, Science Lessons, Action Projects, event materials and special research projects. Optional Field Trips to creek, bay or ocean habitats are also available. Download the Schoolwide Science and Environmental Action Program flyer.